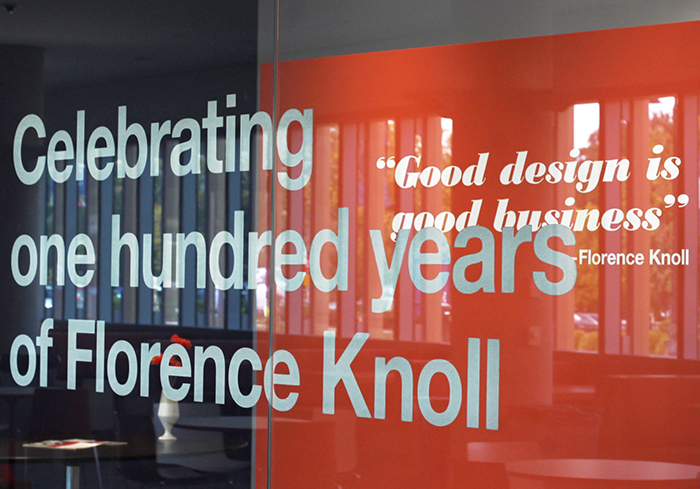 The College of Architecture and Environmental Design at Kent State showcases Florence Knoll's influence and innovation. In preparation for the fall semester, Kent State University opened its gallery doors to a roomful of Florence Knoll’s most iconic designs. 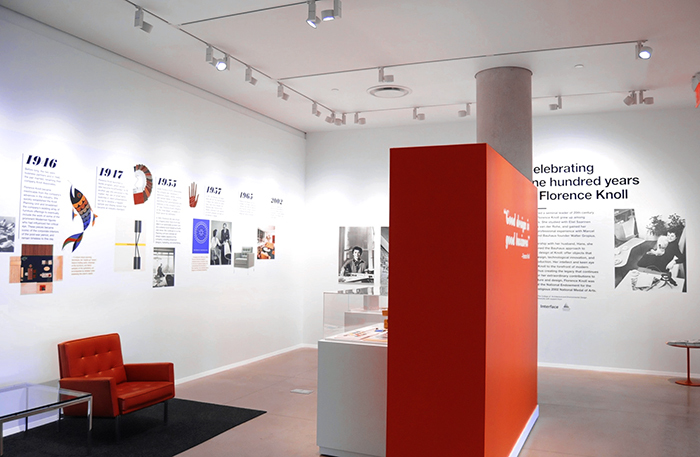 The exhibition, a complement to the celebration of 50 years of Interior Design at the University, also includes archival images of Florence Knoll and her designs; a historical timeline of Florence Knoll’s rise to success; and an array of ephemera courtesy of Knoll. Titled Celebrating 100 Years of Florence Knoll, the exhibition is appropriately located in Kent State’s College of Architecture and Environmental Design. 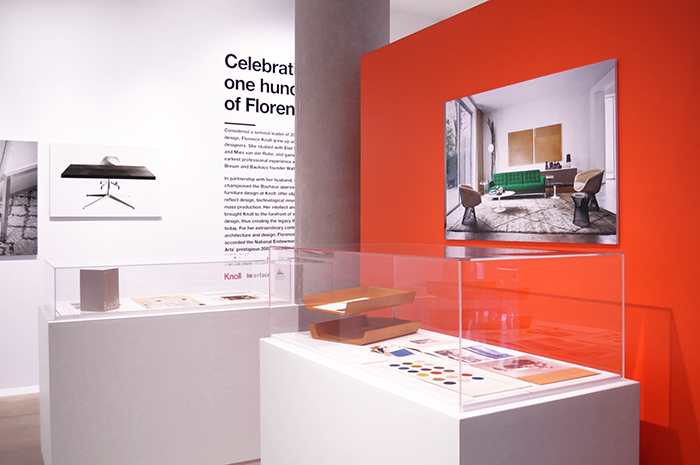 As the title indicates, the exhibition was aimed at celebrating the innovation and determination of Florence Knoll and her mid-century modern designs. Furthermore, the exhibition will act as a continuous source of inspiration as students walk by to and from class. On display is the popular Florence Knoll Table Desk with a blue backdrop, reminiscent of her last exhibition at the Philadelphia Museum of Art in 2004. In addition, there are two vintage Florence Knoll Lounge Chairs that bookmark the rectilinear Florence Knoll coffee table. The walls are lined with historical and biographical information providing an inspiring story around the furniture in the very same room. 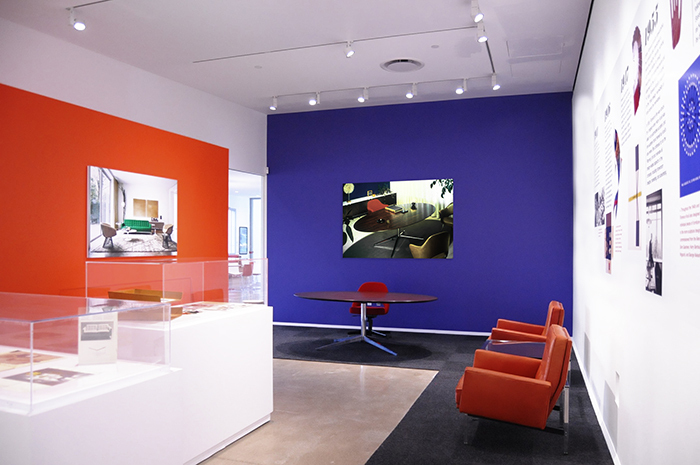 Throughout 2017, Knoll has celebrated a century of Florence Knoll and her inspired brand of modernism, expanding the Florence Knoll Collection with the addition of new and archival products, including the Florence Knoll Relaxed Lounge Seating Collection, the Hairpin Stacking Table, and the Mini Desk. Florence Knoll is a pioneer of design who shaped Knoll and whose innovations continue to influence the way we work and live. With a snapshot of her designs, Kent State University shares her influence with its students. The opening of the exhibit in early September was paired with a student lecture celebrating 50 years of interior design at Kent State and an alumni dinner. Celebrating 100 Years of Florence Knoll is open to the public until October 6th.